« Millstones – Day out! Have you recently been diagnosed or registered with a visual impairment? 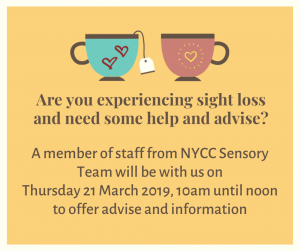 A member of North Yorkshire County Councils Sensory Team will be available to offer advice and information. A great opportunity to ask any questions or discuss any concerns you have.